So, an admiral holding 6 treachery or a new admiral holding no cards, and -1 morale. Probably. 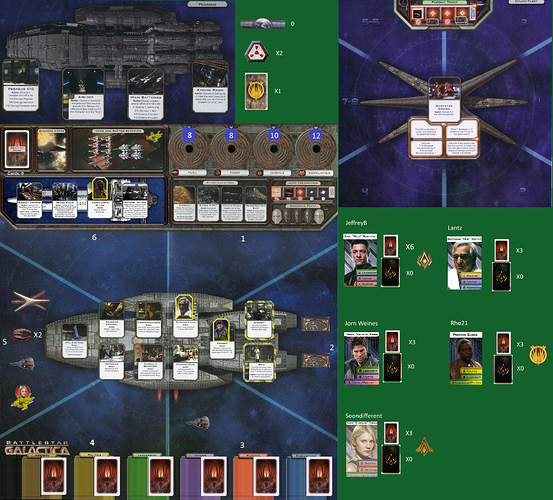 Tempting as it is to try to find a cylon early on, surely we can’t afford to be throwing away morale just yet. Ok, @jeffreyb your cards have been exchanged for a new set. I think 3 fingers of bourbon and a 5 cigarettes an hour should do it. For any card spreadsheet people I misspoke here, I draw Tactics not Leadership. Hmm, seems our leaders loyalties are up for a test. And I will draw a piloting card. I abandoned all my attempts at keeping track of cards a long time ago. Well then time to let go, and go on with your things. More birds in the air is good, I guess. I will move to Command and launch 2 Vipers in area 4. Then I will use my special to play L2 XO on @Lantz. I think it is a bit too early to be completely paranoid. @Jorn_Weines do you want Piloting or dealer’s choice? Dealer’s Choice. But I’d rather have stuff I can use after activating a Galactica location. Isn’t it more usefull to attack with viper. @CraigM, I’ll launch one in Space 4 to speedbump and activate the one in Space 5. I didn’t notice that there was an empty one in 5. I will move to Communications and the provide Treatment to @Jorn_Weines drawing 1 Leadership 1 Piloting. Just to see if I have it all correct. If I start my turn on a Galactica location that is not the Brig/Sickbay, I can take one more action after activating a Galactica location. So when I need to pilot stuff I can activate the Hangar and take two more actions that turn? 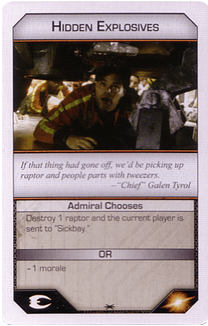 If that is the case then I should stockpile some Piloting cards (preferably Full Throttle, Doc Cottle)!